Nature consists of two types of particles: fermions, the type of particle that makes up solid matter, and bosons, the type of particle that can propagate interactions. Ultralight bosons can form large condensates around rapidly rotating black holes through a process called superradiance. A black hole carrying such a boson cloud is sometimes called a "gravitational atom," because its configuration closely resembles the proton-electron structure in a hydrogen atom, but at a much larger scale. For example, just like the electron in the hydrogen atom, the boson cloud around a black hole can exist in a number of different states, each with a particular energy. In recent years, physicists have been able to measure gravitational waves – ripples in the gravitational field – that occur when pairs of black holes violently merge into a single one. 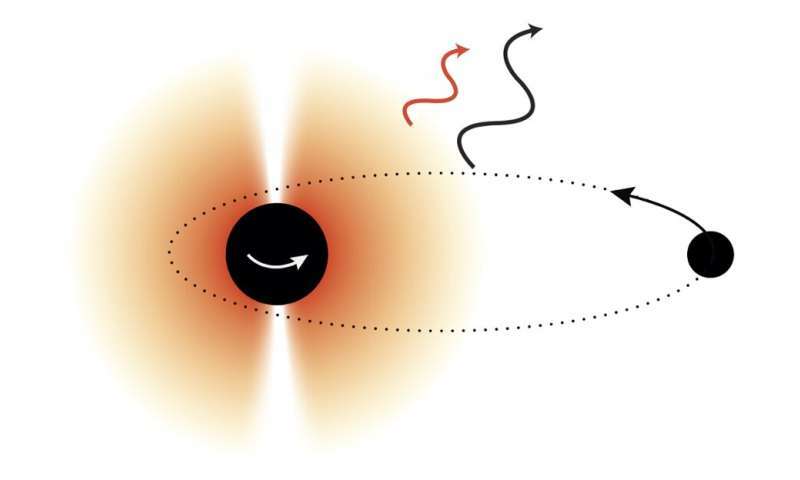 As Baumann, Chia and Porto now show, the presence of energy level transitions in the hypothetical boson cloud would induce a characteristic 'fingerprint' in the gravitational wave signals produced by such merging black holes. Observing such a fingerprint would be an important test for theories that predict ultralight bosonic particles. While current gravitational wave observations aren't yet sensitive enough to observe the effect, this will certainly become an important target of future experiments.